Up to $100 in FREE Gifts! Rewards  Are all rewards created equal? From points, to miles, to cash back – how do you know how much you’re really getting? To help you find the best rewards card, we’ve created the Your Reward Return, an estimate on the dollar value of your rewards based on your monthly spend so that you can compare like for like. Now that’s wise thinking! Earn 2% Money-Back Rewards on purchases in two 2% Money-Back Categories of your choice, and 0.5% Money-Back Rewards on all other purchases. 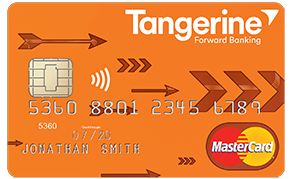 Have your Money-Back Rewards deposited into a Tangerine Savings Account, and get a 3rd 2% Money-Back Category. No limit on the amount of Money-Back Rewards you can earn. Orange Alerts are emailed to you so that you're up-to-date on what's happening in your Account.